Well, we said these Nintendo website listings aren't 100% right. 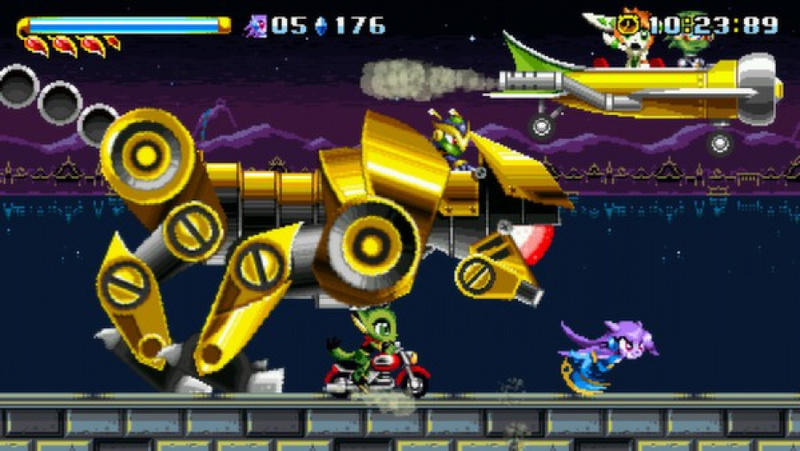 Freedom Planet's developer has tweeted that the game will actually come after the RTX convention (which is 7th-9th August) as development has taken longer than expected. Thanks to Grumblevolcano for the heads up in the comments. It's a common refrain for Sonic fans that are also a bit old - this writer raises his hand - to gnash their teeth and bemoan the state of 2D Sonic gaming. The mascot peaked way too early, in the opinion of some, and what's demanded is a solid, straight up 2D Sonic game. Now, Freedom Planet is very much its own thing, but it's also exciting for fans of the Sega franchise - it did start out as a Sonic fan game, after all. Yet it promisingly expands on its source of inspiration, introduces its own world and makes adjustments to give itself an identity of its own. It was also included in the [email protected] E3 promotion, and we enjoyed it in our first impressions - our own Thomas Jones said that despite the Sonic references it "manages to be a wonderful and individual platformer". The good news is that it'll be on Wii U soon, with fans happily sharing the fact that it's listed for a 3rd August release on the official Nintendo website; that's for North America. These early game page listings aren't always 100% accurate, though, but hopefully it will hit on that date. Already on Steam, it's been met with overwhelmingly positive reviews from PC gamers; here's hoping it lives up to its potential on Wii U. Come on! Playing the demo over and over again isn't enough to quench my thirst for this! And before anyone asks why I don't just get it on Steam...discount. I really can't wait for this game, loved the preview, but I'm not sure I can get it on the 3rd. It is a good game. To me, it plays more like Rocket Knight Adventure with Sonic speed. If you cannot quench your thirst of Sonic, try Sonic Runners on cellphone. It is pretty decent. Its certainly an amazing game in its own right (owns it on steam). Is worth the wait for sure for the ones that haven't played it. I only wish it was a bit longer v.v but man was it a blast on the first run through with each character. Hopefully the Wii U version gets the Shade, Torque, and Milla Adventure and Classic mode DLC. Will probably buy. Too bad Sega hasn't made a classic style sonic game (without the weird physics of Sonic 4 I mean) since the stages in generations. That boss fight pictured was probably my favourite in the game with one of the best background music pieces in the game. Can anyone say Force 7 from Gunstar Heroes? In fact there are loads of little Nods to Treasure and its earlier creations. I enjoy the demo but I don't think I'll buy it anytime soon. Lately I been losing interest in side scrolling platforms. My eshop wallet is ready. I've got the gog version and like other's said it's a great game. Definitely recommend buying it. They did a really good job on it. @Grumblevolcano That's a shame, but thanks! Have updated the article. This game was a game that I would probably buy later down the road. Games I will buy at launch from the demos will be Typoman, Extreme Excorcism, Rive, and Runbow. I can't wait, I've been needing a new game for a while now. My 5 year old nephew wants to play more levels of this one too, he loves the demo. I'm ready. I definitely liked what I sampled from the preview. That's just great, I was looking forward to playing it next Monday. Um...I wanted to play it next week with my friend @Rukiafan. I can wait however long it takes. Cannot wait for this, the demo was brilliant, proper sonic nostalgia and actually the gameplay is arguably better. I played through the (too short) demo five times. Day-one buy when it comes to Europe. I hope this comes to Europe at some point, I find we often wait way too long for localisation on indie games for Nintendo systems. That needs to change by the time the NX launches. I'll just have to play something else I guess. Just as well Rare Replay is out next week. @NintendoFan64 If you want to check it out early on Steam, it's currently part of the Humble Jumbo Bundle 4.